Ultramatch Pro a poor man’s dcs Purcell? After all, an upsampler is an upsampler is an upsampler right? Um, no. Read on! Upsampler, downsampler, A-D converter, D-A converter with every conceivable input and output except USB. It has many functions and even more lamps. Oh, and it costs near nothing. Why is this product here? A friend of mine is trying to get his PC audio to sound good and on his quest he stumbled upon this affordable Behringer product. It is a multi-functional frequency and bitrate converter that normally has its use in semi-professional studio applications. The good thing about Behringer is that all components they have on offer (and they have a very large catalogue) cost near to nothing. Well, in audiophile terms then. But still, 300 euro for an upsampler has to count as dirt-cheap, doesn’t it? The Ultramatch does more than just upsampling. But for our interests, this is its most important feature. It is also an AD and DA converter. One other thing it does is reclock. If you want. And you can even connect an external clock and sync to that. I had no such option so I used the Ultramatch both in slave mode and running on its internal clock. Then I tried all upsampling/downsampling options, as well as the different bitrates, dither and emphasis. In addition I tried all inputs and that turned out to be important as AES sounded different from coax and even the cables turned out to influence the sound. A lot. But more on that later. Connections galore: analog XLR in, analog XLR out, digital coax, toslink, AES in, digital coax, toslink, AES out and wordclock in. Then there arte the many selections to be made: analog audio level, passthrough or resample, change sample rate and bitrate (both up or down), add dither or emphasis and use internal clock, slave or external wordclock. A DCS Purcell on the cheap? Well, no. That was quickly established. While the Purcell adds magic to the sound (as long as you use the dual AES output), the Behringer seems to be more strict. It does exactly what it should do which is being (nearly) transparent and change samplerate and bitrate. I don’t know what this means for both upsamplers. Does it mean that the DCS adds magic ingredients or does it mean that the Behringer leaves them out? To this I’m afraid I have no satisfying answer. All I know is that there is more between audiophile heaven and earth and measurements count for nearly nothing. What I do know is that the Purcell can also sound like the Behringer (ie transparent to the source) if you set its output to cloning. Then it starts to sound strict like the Behringer. But I liked it when set to asynchronous mode, which means that it runs on its own independent clock and there is some processing going on. This managed to make the otherwise clinical sounding Delius sound more human, more “analogue” so to say. So, the Berhinger is no substitute for the DCS Purcell, but that doesn’t mean that it is a flawed device. It should simply be applied for other reasons, in different setups. A Purcell can work to emeliorate “digititis”. It can make a dry sounding dac sound more colourful and more fluid. The Behringer doesn’t do this. It simply converts any incoming smaplerate into any outgoing samplerate. But also with the Behringer, the higher samplerates sounded better to me. Somehow they were more airy, more fluid, more relaxed. Just not in a Purcell kind of way. Oh, and it does something else besides resampling too, and this was also very interesting to put to the test: it reclocks. Yes, this term is used often in cojunction with reducing or, wishfully, even elimination jitter. So potentially the Ultramatch is also a jitter-killer. Good to have when your source is a computer, connected with an extreme length of cable. You can choose to reclock but still have the sampling frequency unchanged, so 44.1 in and 44.1 out, but reclocked. Or even not reclocked, just slaved to the input. There is a marked difference in sound when you switch between slave to the input and internal clock. In general, the Ultramatch sounds quite dry and strict, incontrol if you will. This signature is re-enforced by switching to reclocking when switching to internal clock. This phenomenon is contradictory with the results I had with the DCS Purcell. The latter sounded most dry and strict when in passthrough mode (slave to the input). Whenever you engaged its internal clock (and enter asynchronous mode so to say) it loosened up and became more colourful and relaxed. I liked the higher samplerates best. It was less dry when upsampling to 96khz. Also choosing 24bit output helped in the same way. It quickly established that 24/96 was the way to go. Dither was tried but I found that it rounded off the transients too much. Sure, it made the treble sound more fluid but it lost its drive while not doing enoughn to make it sound like a Purcell. So I chose to use the Ultramatch for its strengths and not try and not cover up the lesser side. Emphasis is a little-known function. It was used long ago much like the analogue dolby noise reduction system. It boosts low level signals during recording to reduce them again during playback. To what end is unknown to me, as the digital process doesn’t add noise. Well, not in the usual way anyway. It works and it make sthe emphasis lamp on my Levinson come on. But it changes the sound in a strange way, the highs become a lot darker as if you use dolby on a cassette that wasn’t recorde with dolby. I wouldn’t say that this function is transparent. Maybe there are different standards here and my Levinson uses a different one from the Behringer. But hey, it is there, should you need it. My PC is located away from the stereo system, connected by a 13 meter long Belden RG59 coaxial cable. The output driving it is a EMU1212M semi-pro soundcard. Thus far I have not heard large differences in digital cable length but now that I have tested the Behringer Ultracurve, I am not so sure anymore. It seems that you lose some dynamics (transient attack) and pace the longer the cable gets. Nevertheless, the sound stays friendly, in an analog kind of way. It is, simply put, very enjoyable. I used Belden RG59 coax cable using cinch in and outputs and a Harmonic Technology Pro ACII powercable, which is know for its richness. On the power side I had done what I could to emeliorate the Ultracurve’s inherent dryness. Being somewhat underwhelmed with its achievements thus far, I decided to try another digital interlink, with interesting results. I made mention of the use of standard cables to emphasize that they have a large influence. I started off with the neutral Belden RG59 coaxial cables. These are cables that I have been using for a long time, in many different setups. These are cables that I know and trust. They are utterly neutral, yet not overly dry or analytical. But since the Ultramatch was so very dry with the PC as source, I decided to try a Wireworld Gold Starlight III+ digital coaxial cable between Ultramatch and Levinson DA converter. Boom! This was the missing link! Now the sound had the snap and rhythm that the Ultramatch provides, but without the annoying dryness and constrained soundstage. I was now really enjoying the sound. In fact, it was dificult to choose between PC direct into the dac and PC via Ultramatch and Wireworld digital cable to the dac. Going direct still made for the most free-floating huge 3D soundstage and the most relaxed sound. But the Ultramatch (as long as the Wireworld cable was used) made for a more energetic delivery with much more drive and focus, while taking only a small amount of aura away. Going direct is no longer a clear winner though, as I somtimes miss what the Ultramatch does. 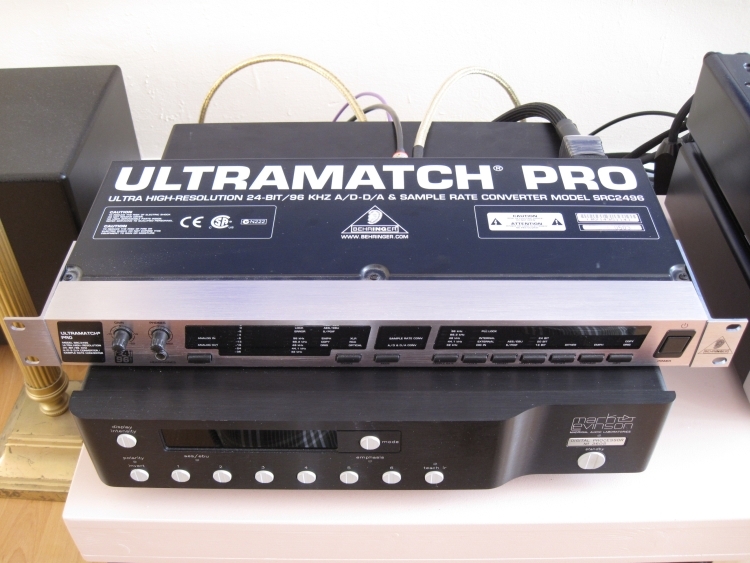 Depending on the kind of music played, it is simply more boring without the Ultramatch. One thing is sure: the Ultramatch works! It is up to you to decide whether you like what it does. I think that I might get one for myself and see what I like best over a longer period. Now that was pretty clear what the Ultramatch does with a computer source, it was time to try my cd player as a source. The Levinson no.390S CD player is one of the CD players that I like a lot. It is very smooth and fluid sounding, despite what you might think of the Levinson brand. I guess that the 390s sounds different from most Levinson products. Its soundstage is enourmous and very airy. It is so very fluid and relaxing that it reminds me of the DCS Delius and Purcell, but with added colour and character. When connected to the no.360 dac it never sounded better. I prefer using the cd player by itself, with its own dacs, even though the 360s dac should be better. I find that using the 360s as a dac, the 390s cd player sounds tecnically better, with better low level resolution, it also diminishes its natural flow. The (connection to the) no.360s makes the sound more digital in a way. It also slows down the pace making the sound more dull. This is not neccesarily a fault of the dac but has more to do with the digital output of the transport and those blasted spdif connections in general. It is always hit and miss when combining transport and dac and in this case it is not a happy marriage. So, in comes the Behringer Ultramatch. Well, I’ll be damned if it doesn’t improve some things quite a bit! First off, the slowing down of pace is gone. 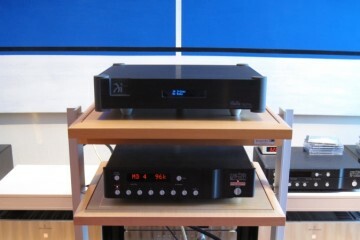 In fact, the sound is now more rhythmic than when using the cd player’s own built-in dac. At first listen even the aura seems intact. There’s a 3D soundfield and the treble is fluid and smooth. 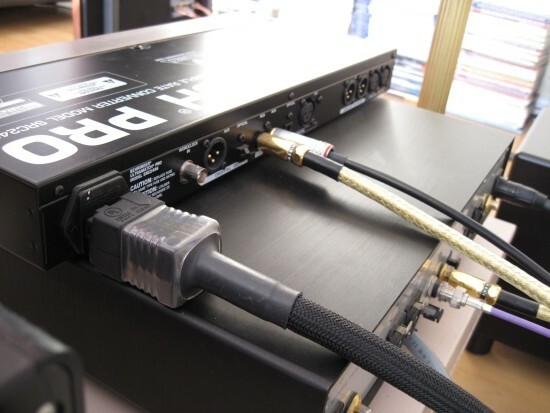 But removing the Behringer from the loop reveals that the sound can be even more free-flowing. Going directly to the dac using the Wireworld digital interlink makes for a more unforced sound that is much more enveloping and less dry while remaining rhythmic. In other words: the cd player is better off without the Ultramatch. Perhaps for its shorter connecting cable? Who knows. In audio, not everything is always clearly cut out. I also tried AES/EBU on both input and output. Both Levinson products as well as the Behringer have AES inputs and outputs so this should count as a good connection method. But I have never liked the influence AES-EBU has on the sound and this was no exception. (see side note below) It made for a technically perfect sound, with plenty drive and attack but with an extremely narrow and flat soundstage. But the worst thing was that it restricted the natural flow that is inherent in music. For some reason AES/EBU always seems to dull the sound in a way that kills the soul of the music. 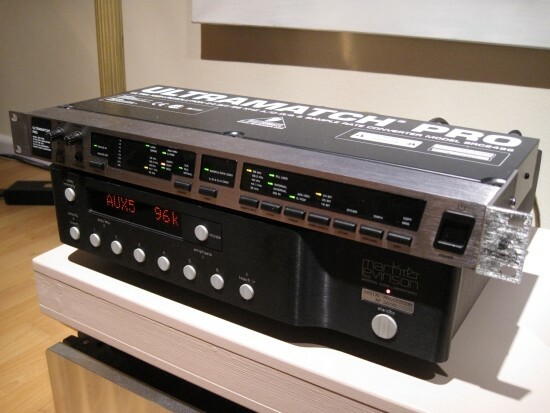 In the Behringer’s case, the AES input turned out to cause less damage than the output. When replacing the AES output cable by the Wireworld coax cable, things were greatly improved. When changing from AES input to RG59 input there was only a small improvement. Of course this was also atributable to the Wireworld cable but as I’ve experienced before, coax is both more powerful in the bass and more relaxed in nature than AES/EBU. Without going into detail too much, you should know that AES/EBU is a professional format, thought up to make up for losses and pickup of (RF) interference when extremely long cables are used. It does this by balancing the signal. It is therefore, not neccesarily the best connection method for domestic purposes. Maybe because of the extra processing going on, I always feel that AES/EBU cripples the sound. Sadly I have no clock generator to try this feature. I do have experience with Wadia clocking though. The effect was a further focusing of the sound with tighter rhythm and more apparent 3D soundstaging. Mostly air inside the Ultramatch Pro… but amazingly there’s a linear power supply! I also tried the built in dac, using the same Transparent Ultra interlinks that I use for the Levinson dac and with a Harmonic Technology Pro ACII powercord so circumstances were good. I used it with the PC but also with the Levinson 390s CD player. No matter how hard I tried though, I couldn’t get the dacs to sound nice. The sound incredibly upfront, shallow, flat, gray and grainy. Sure, it was plenty detailed and focused but to be honest, to me it sounded like a cheap cd player. The Ultramatch is a very interesting little device. No, it is no substitue for the dcs Purcell but it definitely has some very appealing qualities, most obvious being its function as a reclocker. It really tightens up the sound and makes for a more lively presentation. It doesn’t make my PC sound like my CD player but they are 2 different animals and they will probably never sound exactly alike. The point is that it makes the PC sound more exciting and that’s a jump in the right direction! Apparently not all upsamplers are created equal. The Ultramatch’s inherent dry character means that you’ll have to use warm or smooth sounding cables to get the best results but there’s plenty room for experimenting and there’s really no reason why you shouldn’t try one of these if your source is a PC. You might find its attribution addictive! I must mention again that it costs only about 300 euro. I mean, the Wireworld digital interlink is already more expensive! So do yourself a favour – set aside preconceptions and just give it a try. – Input S/PDIF has emphasis, then the button must be set accordingly to do two things: deliver the same information to the outgoing S/PDIF and also tell the D/A converter in the Behringer to apply de-emphasis to give the correct output. – During recording (i.e. the A/D part), the Behringer won’t apply the pre-emphasis. It will only set the bit in the outgoing stream or not. I also complained at Behringer, that one and the same switch has two functions, and if you use the Behringer in A/D and D/A mode at the same time, both will have to have emphasis or no emphasis. The switch is mainly to correct a false setting of the bit in the S/PDIF stream (maybe someone transferred a DAT to some other media and lost a set bit) – or you get a false analog signal where you want to apply de-emphasis by intention lateron. Ok, I won’t operate it often in this mode, but it’s confusing anyway. It’s also odd, that there is no “auto” mode of the switch. I have some CDs from Jean Michel Jarre where it changes from track tom track – so it needs to be adjusted several times. But I bought the Behringer 2496 mostly to check the state of the bits, not to use it as a D/A converter. I’m just transferring my CDs and DATs with a Tascam SS-R05 into a more actual format, and I wanted to make sure that it’s all in the correct way. The Tascam SS-R05 will honor the emphasis bit and remove the emphasis in the digital domain from the S/PDIF input. So I get a file without emphasis for future handling. – There is also an emphasis bit defined in MP3 files. But I’m not sure, how many MP3 players will honor it (i.e. apply deemphasis). I will test it later, when I made all the transfers. – CDs have two location for the emphasis bit: in the table of contents for each track and a bit in the subchannel in the actual data stream. I’m not completely sure what the Red Book for CDs defines. I have a bunch of older classical CDs from Denon, where the bit is only set in the subcode of the subchannel (not in the table of contents), so while playing them all is fine, even with an external S/PDIF-D/A converter. But ripping the CDs with iTunes gives a wrong result: they only check the table of contents to apply de-emphasis for certain tracks. – There is also a program called “sox” which can remove the emphasis in files lateron.